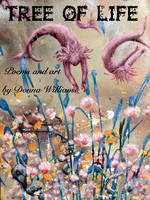 Tree of Life is Donna's 3rd collection of poetry and art. Tree of Life was the product of her progressive development as a performance poet and the result of a series of online 48 hour poetry challenges and is illustrated throughout with many of the artworks she has now sold around the world. This book is by turns whimsical, funny, profound, moving and surreal. It is a 150 page collection of pure ARTism.